Engagement is a big word in purpose-driven business. In fact, it’s a big word altogether: marketers speak of brand engagement, internally companies talk about employee engagement, while in membership organisations or local government they aim for community engagement. Even consultants, such as I, get engaged to work on a project. That’s to say nothing of all the talk in any sphere about making things engaging, from movies to parenting, and from speeches to dates. The versatility of engagement as a phrase isn’t because it’s merely a meaningless buzz word. Far from it. In fact, the reason why engagement as term is used so much is because it describes something that is so vital for the way we work as human beings: so vital in fact, it is an unchanging element of humanity. This element is relationship. Engagement is the process of building a relationship — not just being acquaintances or categorising our customers by transitions — but connecting in a meaningful way that goes beyond transaction to transformation. I call this a bond. It is relationship in its most honest sense: a two-way, participatory, meaningful bond. When we think about engaged employees we think about people who are alive with their work. Engaged customers are passionate advocates. Engaged community members are those who build relationships around a common cause. The list goes on. Engaged consumers buy 90% more frequently, spend 60% more per transaction and are five times more likely to indicate it is the only brand they would purchase in the future. All of these factors lead to engaged customers delivering three times the value to the brand over the course of a year. Where engagement gets relegated to a buzz word is in the implementation. Most people have a hit-and-miss approach to engagement, where they try different tactics in the hope that they will work, but lack the psychological understanding of how engagement actually happens in order to approach it in a strategic manner. The result is, as we’ve said, hit-and-miss, leading to up-and-down, hot-and-cold engagement, rather than a progressive, sustained increase of engagement over a period of time, and thus, the phrase is relegated to buzzwordery. Engagement is not marketing. It is not HR. It is not branding. It is not corporate social responsibility. Engagement is an art and discipline in its own right, a unique take on the world with its own set of principles and nuances, as we shall see. Thus, in this article we will solve the problem of implementation by looking at what the three stages of engagement are, and how we can follow them in a strategic manner. Once upon a time a farmer sowed some seeds into a field. Some seed fell by the rocks, some was eaten by the birds, but some fell on good soil, and it grew roots, matured into a plant, and eventually it bore fruit. When the fruit was ripe, the farmer picked the fruit into a basket. Once all the fruit was in the basket together he took it to the market, and the fruit was used to feed the village. Many of the villagers, once they’d eaten their fruit, took the seeds from the middle and planted them in their own gardens, and so the story began again. You’ve no doubt heard this story before. From being a kid who learned about what the seeds were in your apple core, to the lessons that religion teaches us about sowing and reaping (hat tip to Jesus, from whom the analogy is taken directly from), to those who grow their own fruit and veg today, this is a familiar story. And in this familiar story we find the three irreducible ingredients of engagement. (Maybe you’ve already worked out what they are?) Let’s look at them one by one, and in doing so, discern how engagement works psychologically and strategically. The first stage of engagement, like we saw in our story, is that of scattering the seeds of our message. If we think about any form of engagement, whether it be a friendship, a company employing us, or a brand getting our attention, it begins with someone putting something out there, and giving us the chance to respond. Scattering is an apt word for a few reasons. In the story we saw that some of the seed that went into the soil became plants and later on had fruit. But some seed didn’t get very far. In the same way, for instance, when we communicate an idea or ask someone to go on a date with us, there is always the chance that they might respond (get into the soil, become a plant), or they might not (get eaten by the birds or fall onto rocks). Scattering understands that there is nothing wrong with a person not responding, because it will always be the case that some respond and others don’t. Perhaps your product isn’t what they need right now. Perhaps you aren’t their type. Perhaps your company isn’t right fit for the employee you’re trying to engage: but don’t worry, it will be the right fit for someone else. So the lesson of scattering is to realise that you don’t know who will respond: but on the other hand, this often means those who we don’t think will respond often do. All of us have had times where we thought a business deal or arrangement would come from one source, but the person we expected to respond didn’t, and instead someone we didn’t expect responded to the opportunity. In a public speech, not every point that you make will hit home for every person. The worst thing you can do then is keep trying to make the point fit for everyone. Rather, one scatters a few points, each one with the potential to reach different parts of the audience. What about scattering in community management? It means then when you want to engage your community, know that everyone simply won’t respond to every message you put out, or every request to fill in an annual survey, or every invite to have a Skype call with you. And that doesn’t mean you’re wrong or bad, it just means it’s not right for them, at the moment. The worst thing we can do is keep badgering people who don’t want to be engaged right now, and then end up forgetting those who do want to be engaged! The imperative with scattering is that whilst we know everyone won’t respond, we still want to give our message the best shot, and so we need to prepare it to be a ‘good seed’, as it were. This is why scattering is about messaging: thinking deeply about what we are saying, how we are saying it, and why we are saying it. For instance, if I want to start a conversation with someone I don’t know, I am best approaching them politely, and without any pressure for them to respond. If I go in rude and abrasive, I reduce my chances of engaging with them. It’s common sense, but not necessarily common practice. More on this in the participation section below. One more note on the scatter stage. The best seeds (the best messages) are those that can spread easily. If you make your message spreadable, that is, easy to share, but also enticing to share, and even valuable to share, then you have begun to master the art of scattering. The second stage relates to the second part of the story. After scattering the seeds, the ones that went into good soil begin to become plants, and they go on to bear fruit. At this point, the farmer gathers the fruit into a basket. This is the second stage of engagement: gathering. To understand the gathering stage fully, let’s look at something called Stimulus and Response Theory. It’s a learning theory that quite simply states communcation works by one party providing a stimulus, and the other party responding to that stimulus. 1. The scatter stage is necessary for engagement! Someone can’t give a response without a stimulus – the scatter stage is the stimulus, and our best chances of a response are to make our message acceptable and easy to engage with. 2. The response signals interest, and the commitment of the second party to engage more. Based on this, we can engage a bit more with them, so watching for the signal is very important. Therefore, when we scatter in engagement, we are providing an opportunity for someone to respond and engage with us. The gathering stage is where they actually do respond, and in the case of the story, this is signalled by bearing fruit. Of all our engagement scenarios, however, most are not one-on-one, but rather group conversations. 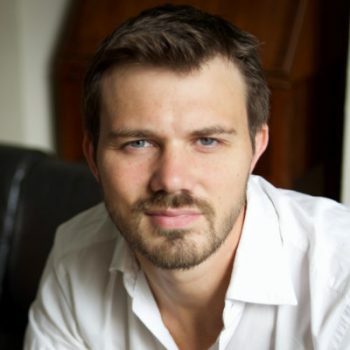 This is where engagement takes on a unique shape in contrast to its relatives of PR and Marketing. In the instance of the farmer, he gathers all the fruit together into one basket. We can say that they are therefore gathered two ways: to the author of the message, and to the fellow responders to the message. When people respond to our message, we should not only gather them to ourselves, we should gather those people to one another. The reason for this is about identity, undergirded by the two theories of Social Identity Theory and Social Proof. When one person responds to us, they are just one person. But when they see that others have responded too, it gives them a sense of identity as a ‘responder’, and thus a group has become. No longer are the respondents bonded only to the initiator of the engagement, but to each other, and like a triangle, this three sided shape is far stronger and more resilient that a single two-way line. What does gathering look like in practice? For a retailer, gathering is what happens when a customer comes into the store and sees the other customers. For a community like a church, it’s when people attend service on Sunday. For a relationship, it’s when someone agrees to join you on a date. And in the case of community engagement, it’s when someone makes an act of participation. And that word, participation, is one very, very important word. Participation is the currency of engagement. Anytime we are talking about engagement, we are talking about people participating with one another. This is important to note, because the way to engage with someone is to provide an opportunity for them to participate with you, and then if / when they do participate, to participate a bit more with them again, which hopefully encourages them to participate back, and the cycle continues. The offer of participation is something like a handshake: we stretch our arms out, and wait for the other party to take our hand. And if / when they do, we don’t just hold it, we shake it: a mutual participation with one another. The mistakes that we normally find with participation are when people ask for too much participation, or too little. For instance, it is known that to get someone to signup to an online forum, you need to ask for minimal information, else the barrier to entry is too high and they won’t signup. But it’s a problem if there’s too little information as you don’t know enough about them. The solution then is to scale the ask: ask for little when they first signup, more once they’ve completed their signup (onboarding) and more at key points in their journey from introductory to intermediate or advanced user. We can call this scaling the levels of participation. What are these levels? 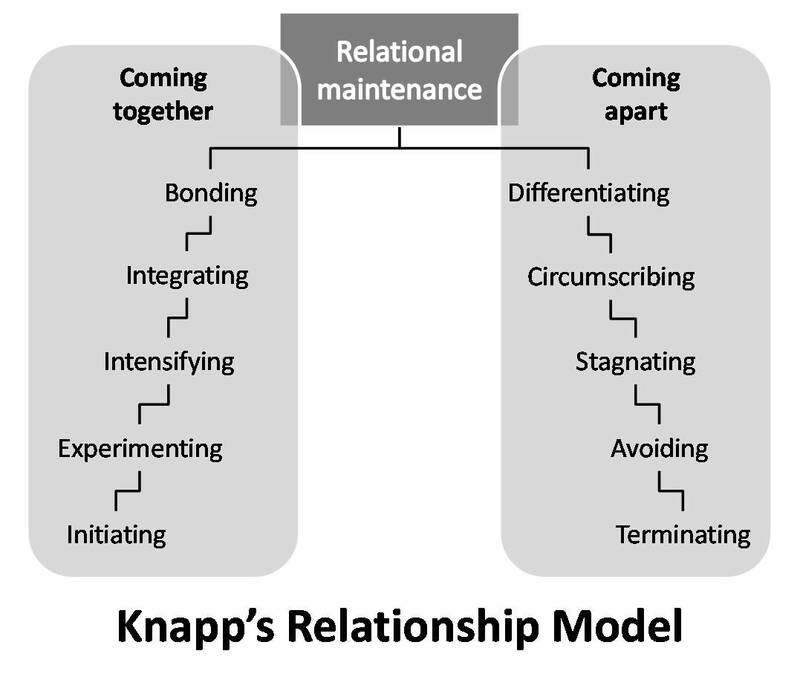 The relational theorist Knapp created the Knapp Relationship Model (funnily enough! ), in which he identified 6 levels of relationship-or participation-between two parties. You can see it in the image below. We won’t go into it now, but this will no doubt give you some food for thought: what is experimenting for you, or bonding for you? Let us return to our story, where we find the farmer has now taken his fruit to the market and it is being used to feed people. The third stage of engagement is to take what you have gathered, and turn that into a lasting resource that empowers people. For the farmer, this means using his fruit to feed people. For an event manager, this means turning the attendees for an event into a community that meets up regularly to discuss the themes. For Apple, it meant creating an App Store where people could sell apps that empower people. We often know this stage of mattering as what many call platform, because it often means creating a platform that people can build their lives on (quite literally, like a platform!). A platform matters to us: it enables us to do things we couldn’t do without it. For instance, Facebook enables people to connect with friends in a way they coudn’t before, and it enables businesses to offer their services to targeted groups in a way they coudn’t before. The point of a platform is that it elevates us above problems which it eliminates. As an example, Google Adwords eliminated the need to know where to market: they were all there on Google, you just needed to use the platform. What some describe as the Engagement Economy is about users connecting with organisations based on their ability to provide meaning, connection and empowerment. It’s more than transactions, it’s transformations. So mattering is where we seek to engage with users beyond what they can benefit from on the surface: we seek to engage on matters of purpose and meaning, the bigger narratives of life. There’s one last part to our story. After the farmer had used his fruit to feed people, people took those seeds and started the process over again. When we engage people to the level of mattering, they become advocates who take the messages and sow it onto others. Indeed, in the same Rosetta study, they found that engaged customers are 4 times more likely to advocate to colleagues and acquaintances than unengaged customers (those who stop at the transaction). Engagement is noble work. It is empathetic, caring, and valuing. It requires servant leadership and mighty resilience. And it’s payoff is huge for all parties who get in on the engagement, because it is a transfer of something that’s more than money — meaning — in exchange for something that is all the more needed in our connected yet disconnected world — a bond. Took me a while to realise it was you, Stephen. Thank you. An early, wordy draft, but at least I’ve got something out the door! Really well thought out and presented piece of work. Will read again. Thanks Bro! Means a lot coming from you! Good to see you sharing your wisdom Scott. Love you deep thinking! While I was reading this, I kept thinking about Conversational Intelligence. Check out that book. Very insightful about the science behind conversations and moving from transactional to trust. Dave, old friend! Lovely to hear from you. Thank you for the kind words: this is an early, wordy draft – I have much more in my journal, so hopefully I can get that up. I will check out the book – thank you for the recommendation. The transaction to transformation part is of course hat tip to Joe Pine and his work on the upcoming “Transformation Economy”. On another note, how are you? Scott this is fascinating and relevant work. I’m so pleased to see it come out into the light. Can’t wait to see what’s next! Thank you for prompting me!